Many people visit our island on a limited time schedule. With our Snorkeling Day Pass you won't have to worry about making it on time, or if we'll be finished in time. 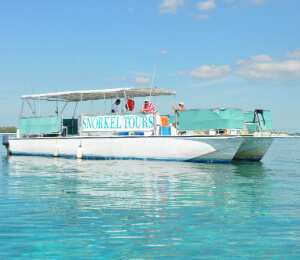 We have an on demand catamaran that is on hand to transport you to a beautiful area of coral gardens at any point of the day between 9am and 5pm, for as long as you wish. Want to take a lunch break, or even a nap, feel free to do so and come back out later for more! Swim with an immense number of tropical fish while at one of our many snorkeling locations off the coast of Grand Bahama Island! You'll be provided with snorkeling gear, any instructions regarding safe use of the gear, and how to snorkel also. I have been to the Bahamas many times, but Snorkeling Day Pass is one of my favorite trips! It includes everything that everyone should do here. As a Bahamas veteran, I can say only the best about this experience!